This year our High Power Matches will be sanctioned by the CMP and will follow the CMP Cup format (both service rifle and match rifle), fired for CMP classification, two sighters in each position, rapid-fire beginning in position, with no alibis. The CMP 2019 High Power Rifle Rules again some changes. You can click on the URLs for the new CMP and NRA rules posted below. While service rifle will be very close to last year, there are some minor changes and clarifications to the rules. 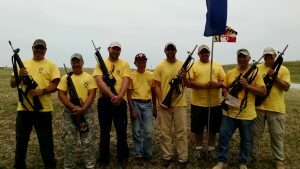 Dates for the 2019 high-power rifle matches will follow a similar schedule (4th Sunday from April through September) – April 28 (50 round); May 26; June 23; no July Match due to Camp Perry; August 25; September 22. The York Riflemen 2019 Garand Matches (30 rounds) are April 28 and October 5 (course of fire is Course A) 15 shots slow-fire prone (first 5 shots are sighters); 10 shots rapid-fire prone; 10 shots slow fire standing. All shot from 200 yards. High-power matches are fired at 200 yards. Reduced targets are used to simulate 300 and 600 yards when appropriate.